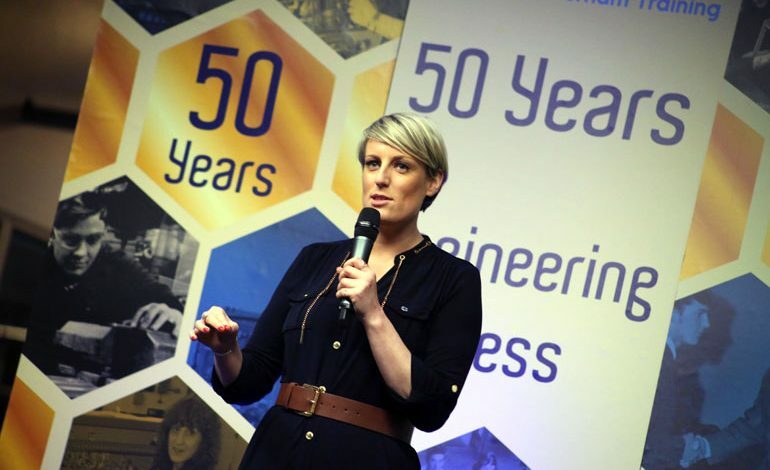 BBC Breakfast presenter Steph McGovern praised the work of South West Durham Training in preparing the young engineers of the future as she led celebrations for the centre’s 50th anniversary. Recalling her time at Black & Decker in Spennymoor under the Year in Industry scheme as a teenager, the Middlesbrough born business journalist hailed the value of apprenticeships to industry to her audience of employers and past and present students and staff. It was this placement which ultimately led to her big break in television, as Steph won a Young Engineer for Britain competition aged just 19 for an injection moulding process innovation for the firm’s garden leaf sweeper and blower. The award saw her invited to appear on a TV programme about women in science, before securing a position as a part-time researcher on BBC’s Tomorrow’s World while studying mechanical engineering at London’s Imperial College. Today Steph is the lead business presenter on BBC Breakfast, and also hosts BBC’s Watchdog and Shop Well For Less programmes. More than 100 employers joined current and past students and staff of South West Durham Training at the event, held on the 50th anniversary of the official launch of the centre by WWII RAF fighter pilot Group Captain Sir Douglas Bader in 1967. SWDT has had more than 10,000 young engineers through its doors over its 50 year history, many of whom work in senior positions as far afield as Australia, the US, China and Dubai. Alumni include the Chief Executive of Gatwick Airport Stewart Wingate, the MD of car parts maker Nifco UK Mike Matthews MBE and comedian Vic Reeves. Other speakers at the event included Chair of the County Durham Engineering and Manufacturing Network David Land, an apprentice at SWDT in the 1970s, and Dave Allison, who was among the first intake of apprentices in 1967 before returning in 1973 as an instructor. He stayed for a further 40 years before retiring in 2013. SWDT was the first training centre in the country to gain Centre of Vocational Excellence status in 2002. The Chief Inspector of Adult Learning in his annual report that year described SWDT as ‘world class’. In 2014 Ofsted graded SWDT as ‘outstanding’ in all four areas: overall effectiveness, outcomes for learners, quality of teaching, learning and assessment, and effectiveness of leadership and management. It was the first member of the Group Training Association of England ever to have received an outstanding grade across all areas of provision. The same year saw the launch of a partnership between Bishop Auckland College and SWDT. 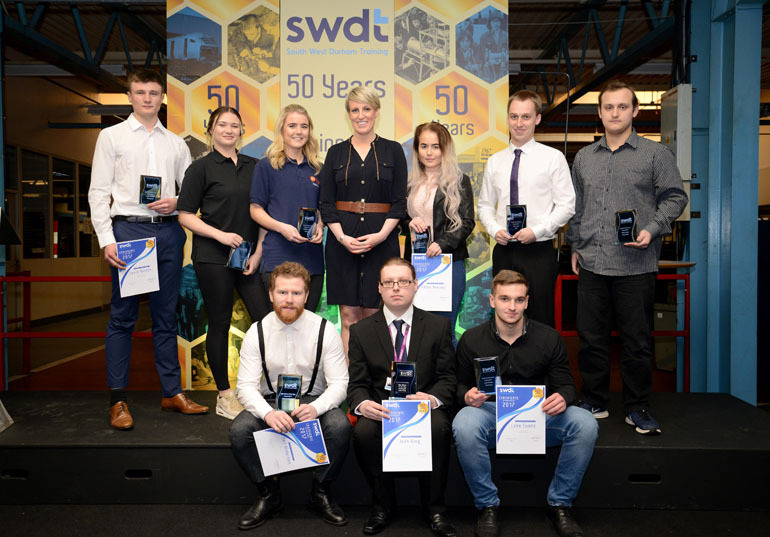 Andy Dunn, Chair of the SWDT Board, who also spoke at the ceremony, said afterwards: “This has been a fitting celebration for South West Durham Training’s 50th anniversary – it was great to see so many employers here – many of whom are former apprentices themselves.